This was the last major raid of the war on Frankfurt, and the 378 Lancasters that took part in it caused severe destruction in the western districts of the city which contained many industrial buildings. We flew in under 2,000 feet to our first turning point well inside France, then climbed to 17,000 feet, flew in and bombed. After target nose down to 11,000 feet then a bit later to 8,000, then home. Had F/S Sobering as a second pilot. Quite a bit of difference between the France of the “pre-beach head” era and the France of today! I went right down over France and had a good look at the place - Lord, there’s bomb craters all over the place! There were quite a few chops (one fellow ran into the deck near the turning point). We logged five definite ones and saw several others which we couldn’t be sure of. There was another one of these cookie explosions on the run up about twenty miles ahead of us which didn’t leave any pieces! Just a savage red flash and a puff of smoke. It was a damn sticky target all in all – as many searchlights as I’ve seen anywhere. We were coned twice on the run-up and did some high and mighty twisting and turning! I straightened out in the second cone long enough to drop the stuff (about ten seconds) then left the vicinity in a bit of a hurry. It was an absolutely clear night and the old searchlights were really going. 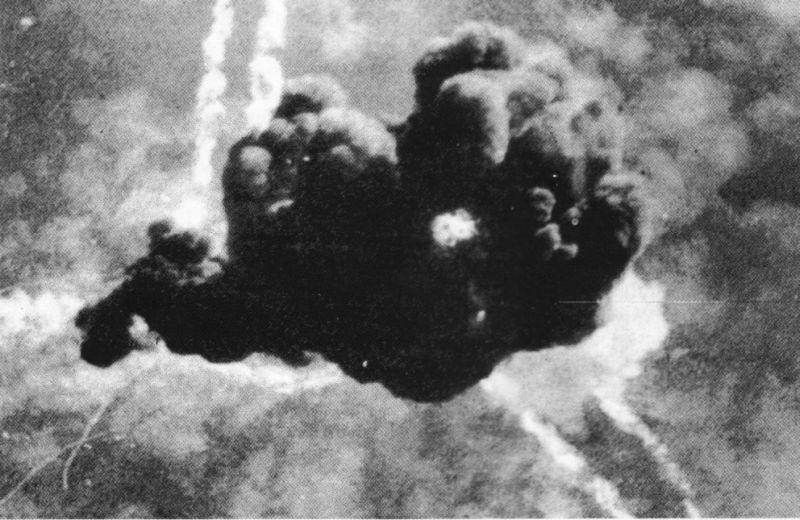 I found out the next day (13th) that 17 were lost from about three hundred aircraft.